What is my unique account ID? How do I sign out of all my devices? How do I delete my backup data? How do I permanently delete my SwiftKey Account? How do I remove a word? Where can I find Microsoft's data policy? You now have access to a portal that allows you to control your personal data and SwiftKey Account preferences. Open your SwiftKey app, tap 'Account', then scroll down to 'View and manage your data'. When you created your SwiftKey Account you'll have been asked to supply details of either your Google email address, Microsoft Account, or Facebook (iOS only). If you've forgotten (or not sure) check by opening the SwiftKey app and tapping on the 'Account' icon. 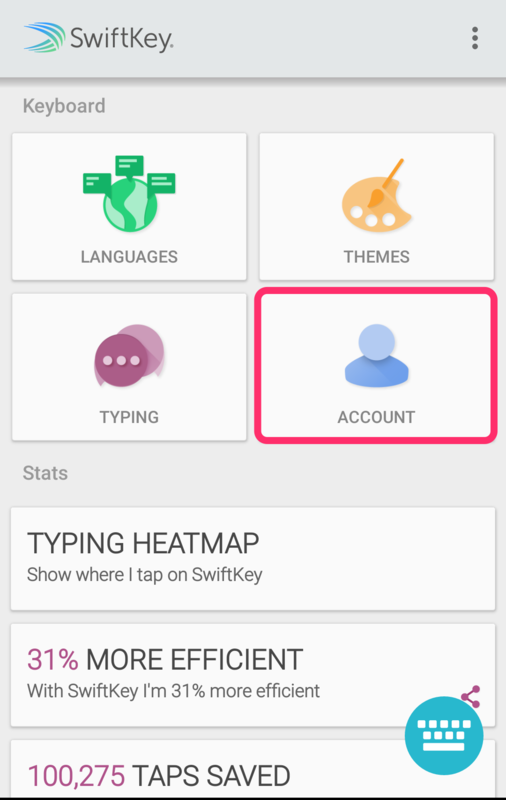 Here you'll find the account information used to create your SwiftKey Account. On the data portal tap the button that corresponds to your Account provider, then select your Account. Make sure you're not trying to log-in using your details from the SwiftKey Support site. The portal is different to our SwiftKey Support site, and as such you won't be able to use the same log-in details. 2 - What is my unique account ID? Your unique account ID is a random alpha-numerical string generated when you first create a SwiftKey Account. We might ask you for it to aid with troubleshooting if you've submitted a support ticket. The portal allows you to view and export your data. These options can be accessed by tapping on the 'View data' menu item. On this page you can view a scrollable list of words that SwiftKey has learned over time. This could be useful if you just want a refresher of the things you've typed into your keyboard. Alternatively, you can download all your words to a file you can keep. To do this just tap the 'Export all' button. Please note it may take a little while to process your request depending on the size of your language model. Your file serves as a snapshot in time – in the future, you'll need to download a new file in order to see any new words you add afterwards. Tapping the 'Log out' button will sign you out of SwiftKey on all of the devices your Account is connected to. Tapping the 'Delete backup' button will permanently delete any data you've previously taught your SwiftKey Keyboard. This cannot be undone or restored using any previously downloaded files. 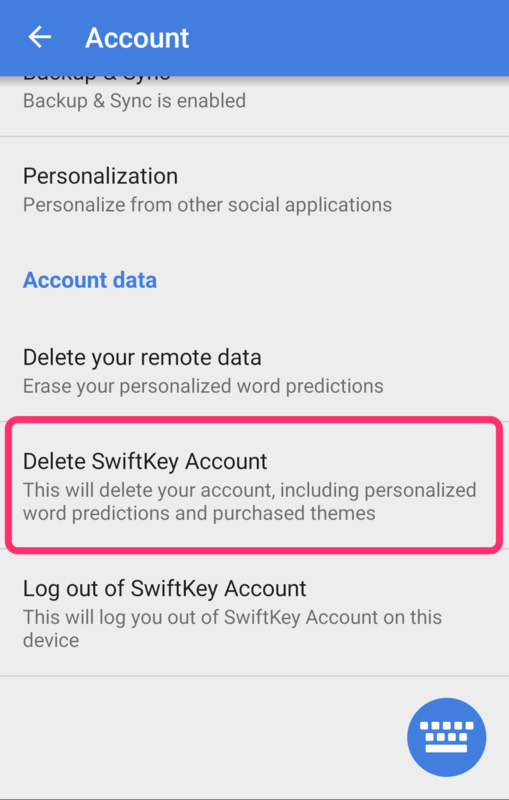 Tapping the 'Delete account' button will permanently erase your entire SwiftKey presence. This includes any previously downloaded content and all the words you've taught SwiftKey over time. 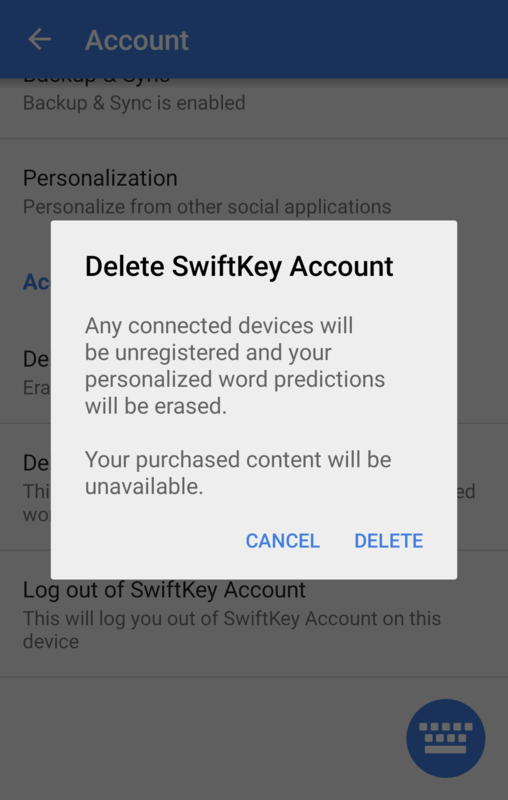 You'll also be logged out of the data portal as you will no longer own a SwiftKey Account. Remember: deletion is final, there is no going back. It's easy to remove words that SwiftKey has learnt, but you can't do this through the portal. Long-press on the word(s) you'd like to remove in your prediction bar, or follow the links to our tutorials on the SwiftKey Support site. While it's possible to download a list of all your saved words via the portal, the SwiftKey app provides an at-a-glance view of your vocabulary size. Just open your SwiftKey app and scroll downwards to see it. Your vocabulary is made up of words that fall into two groups, namely: static (words SwiftKey already knows) and dynamic (words you teach SwiftKey). There will be occasions where SwiftKey learns words you might have expected it to know. These aren't gaps in its knowledge per-se, they are perhaps better looked upon as instances where words have been used in an unfamiliar context. The portal provides access to Microsoft's Data Policy, Microsoft Privacy Statement and Microsoft Trust Center. How do Cloud Predictions on SwiftKey work? When you enable Cloud Predictions SwiftKey will suggest hashtags and other useful predictions by sharing the last few words you typed. The hashtags are based on what's popular on Twitter. You'll need to have a SwiftKey Account and be signed in to use Cloud Predictions. How can I ensure Backup & Sync doesn’t use up my Internet Data? My SwiftKey Keyboard predictions have disappeared! If you've recently changed to a new device, your 'SwiftKey Stats' will be empty. These don't transfer across devices, and could cause you to wrongly assume your predictions have disappeared. If SwiftKey Keyboard is not listed, you will need to find it in your list of apps, select it, and complete the installation process. Press the keyboard icon in your notification bar - choose 'SwiftKey Keyboard'. SwiftKey Keyboard deliberately does not offer predictions in some text fields: i.e. password fields and the 'to' field of emails. The app also does not offer predictions in other apps with code that clashes with SwiftKey Keyboard’s predictions. Check that 'Backup & Sync' is enabled, and it has recently synced (within last few hours). If it hasn't, toggle the button to force a sync. Start typing an email address (or other such saved text) to confirm your predictions have been restored. Additionally, if your language pack download has failed, then you will not see any predictions. Please ensure that you are using a strong WiFi connection and have plenty of space on your device, and then try downloading again. If your device’s SD card is mounted (connected to PC using USB cable), then you will also not see any predictions, as the language models are stored on the SD card.